I was looking for an easy appetizer that could double as a good snack for the kids. I was making a pretty elaborate dinner too so I wanted something fast for the kids but still fun for them. I've had some pre-made polenta for a while. I bought it with the intention of trying it out because I've never really gotten into polenta that much. Will the kids eat polenta? What better way to introduce kids to a new food than make it a pizza?! 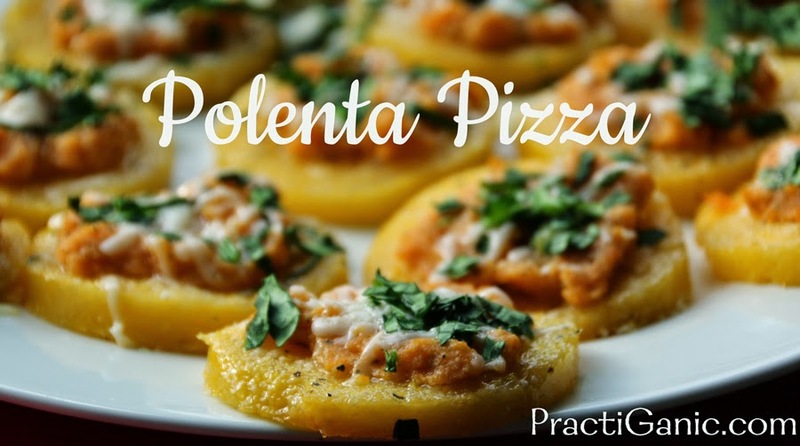 Mini Polenta Pizzas went over great with my guests and the kids enjoyed them as well. Since the first time I made this, I now always have some pre-made polenta on hand. I think I'll need to start making my own! I used Sweet Potato Marinara Sauce, julienned spinach and shredded parmesan cheese. For the appetizers, I drizzled a little balsamic glaze over top. It made them look so scrumptious! Slice the polenta into 1/2 inch slices. Bake on each side for 4 minutes. Top with your favorite toppings and bake for another 3-4 minutes or until cheese melts. After they are out, top with a balsamic glaze.